Colorful Stitchery may look a bit familiar to some of you, and that's because it is a reissue from 2005. Roost Books has revamped the book but it still holds up and may be even better than before. 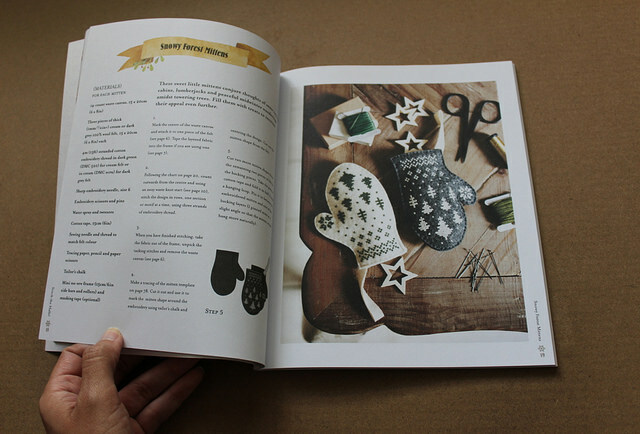 The projects in the book are great for beginner to advance stitchers, so there is something for everyone. One of the things I love about the author, Kristin Nicholas is that she not only gives us great projects, she explains the tools and techniques needed. Her book offers clear, easy to understand directions. I felt as if I had her in the room with me, guiding me through each step. The only problem I have with this book is which project to start with first! Do I stitch the embroidery blanket or maybe the chicken scratch pillow...decisions, decisions! 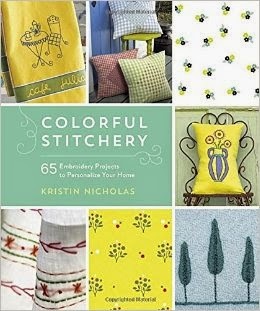 Do yourself a favor and go to your favorite book store and demand Kristin Nicholas' Colorful Stitchery. You can thank me later. Stitch the Halls Review and Very Special Giveaway! Hello all! 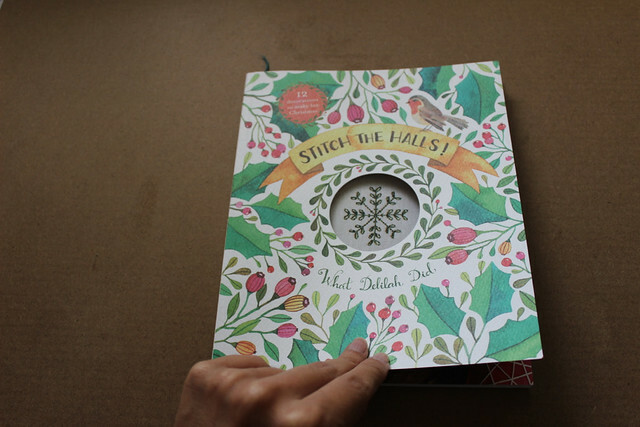 I'm reviewing Stitch the Halls by Sophie Simpson from What Delilah Did today, and we're also doing a very special giveaway! 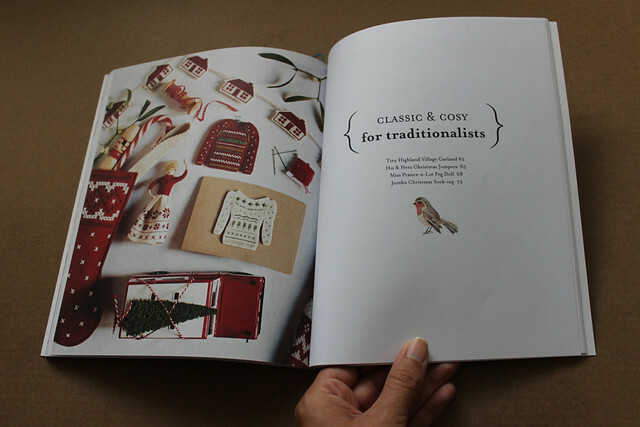 This is an absolutely delightful book that I wouldn't hesitate to add to your library - the main focus of this book's projects is counted cross stitch and embroidery, but many of the projects could easily translate into freeform embroidery, as well. 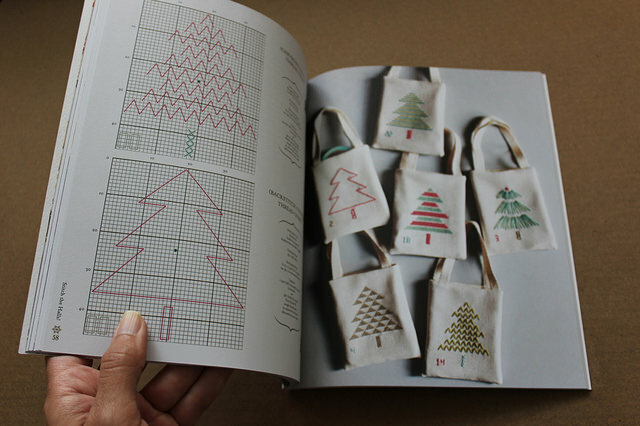 The book begins with a nice summary of counted embroidery basics - going over fabrics, thread, and frames, and how to read counted charts. 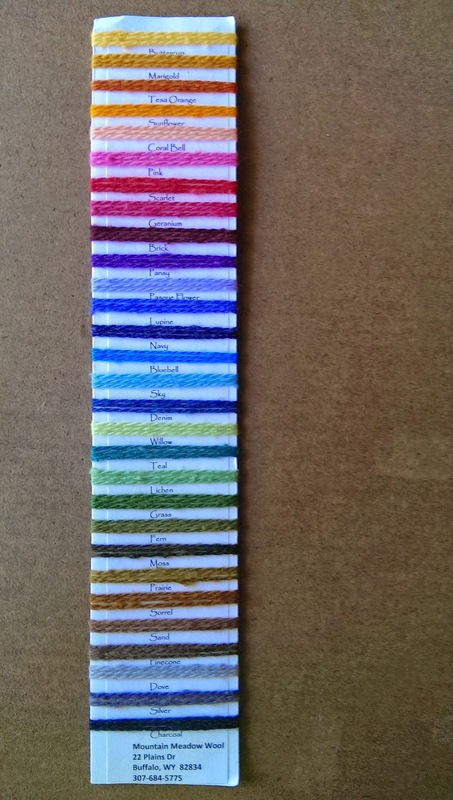 There's also a helpful stitch directory of 11 counted stitches you can use in addition to the basic cross stitch. 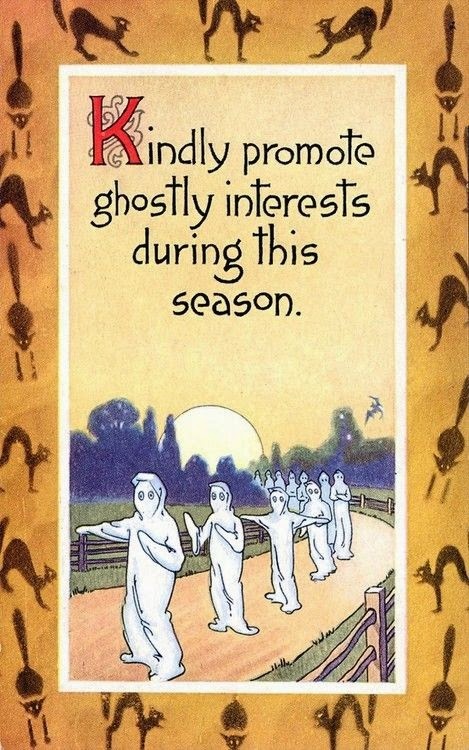 Let's open it up and have a look, shall we? As you can see, the watercolor illustrations by Ana Victoria Calderon are absolutely gorgeous, and you'll find them throughout. 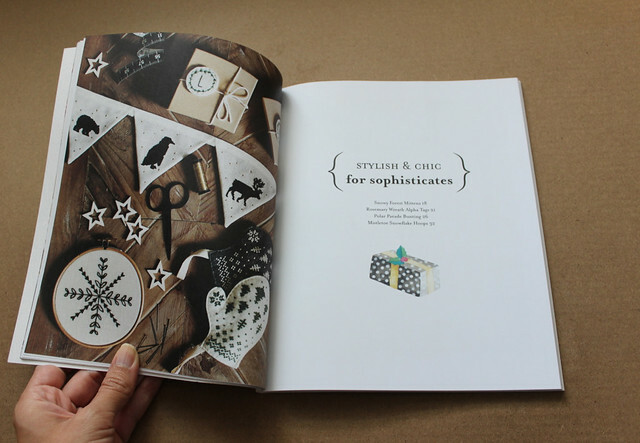 The book's 12 projects are divided into 3 broad categories: Stylish and Chic - for sophisticates; Merry and Bright - for modernists; and Classic and Cosy - for traditionalists. Last up is the Cosy and Traditional section, and although there is a traditional selection of red and white, the patterns don't lose their clean, modernist take - and how adorable are those mini Christmas sweaters?! What I love about these patterns is that there is plenty of room for creativity - they are fresh and modern while being classic and elegant - in short, not unlike What Delilah Did's signature style. 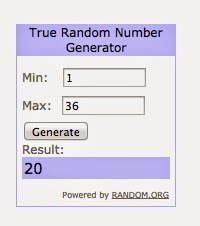 So, on to our giveaway! I call this a very special giveaway because in addition to the review copy which we were kindly sent - we have been offered 3 copies of the book to give away to our readers! 3 copies! 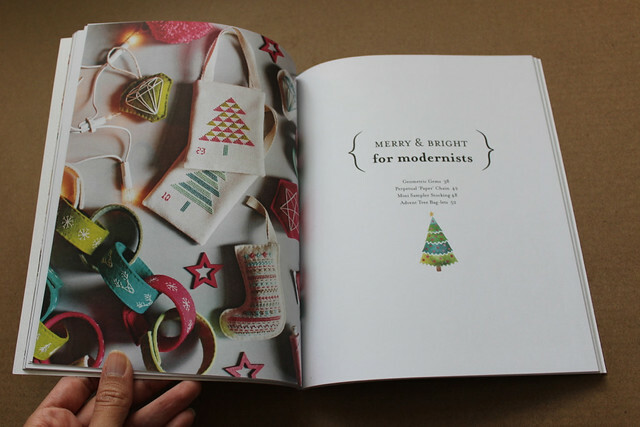 You have 3 times the chances to win this gorgeous book, just in time to do a bit of Holiday stitching. 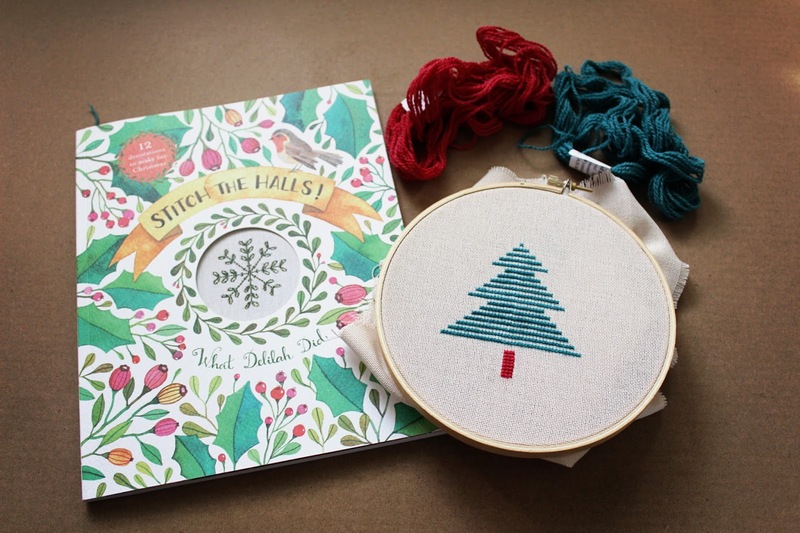 To win a copy of Stitch the Halls! 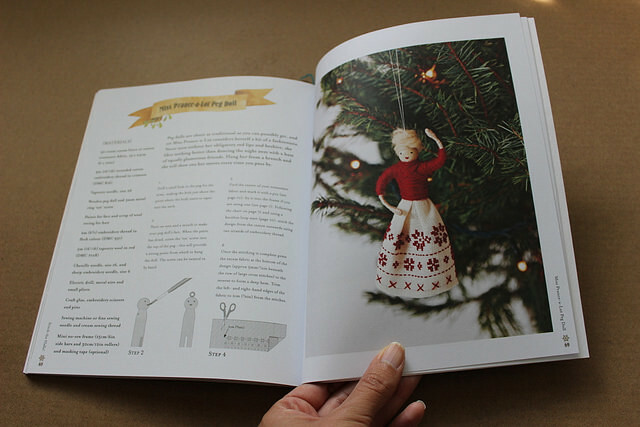 : 12 Decorations to Make for Christmas , simply leave a comment on this post by Sunday, October 26, 9 PM US CST, and tell us, which section of the book appeals to you most, and what do you think you might make? When I first saw this on Flickr I thought that it was just printed on the fabric and then a little bit of stitching around the image. 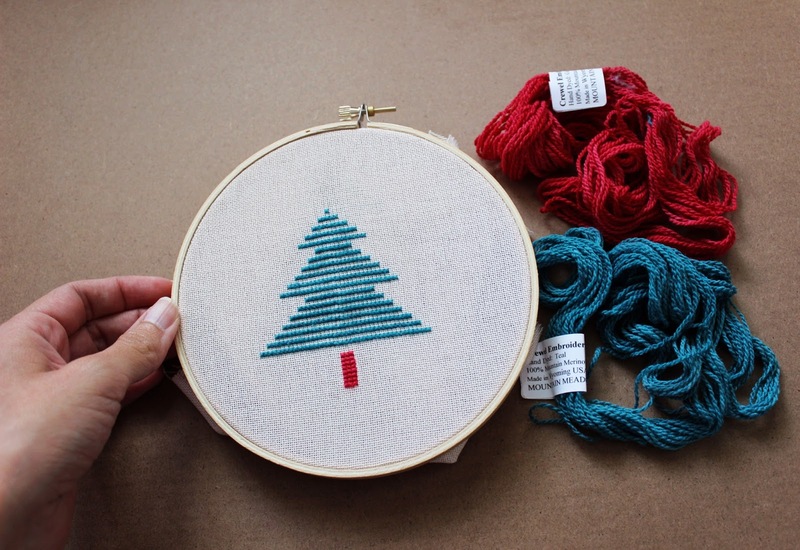 The entire piece is embroidered with various types of stitches. 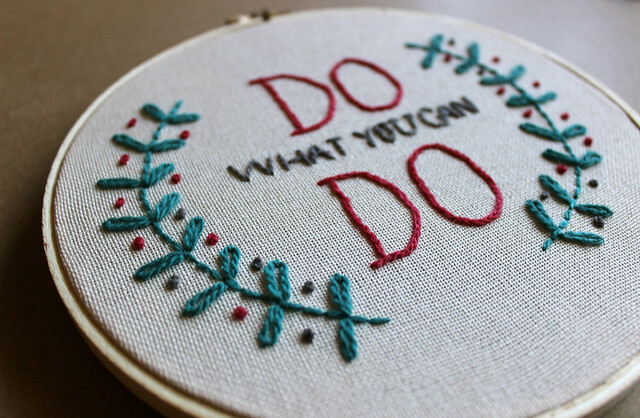 It is fully embroidered, people! You can pick your jaw up off the floor now. Mother Eagle's The God of Crabs is absolutely stunning. I'm not sure there are enough adjectives to describe how amazing this is. Check out the various stages of this piece here. Also check out her other pieces of art, you will not be disappointed. Many of her pieces are available on her website and you can see other collections there as well; Made By Mother Eagle. 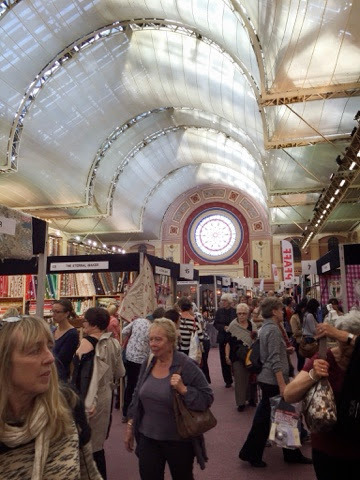 Feeling Stitchy was very kindly invited along to The Knitting and Stitching Show this year at Alexandra Palace in London. 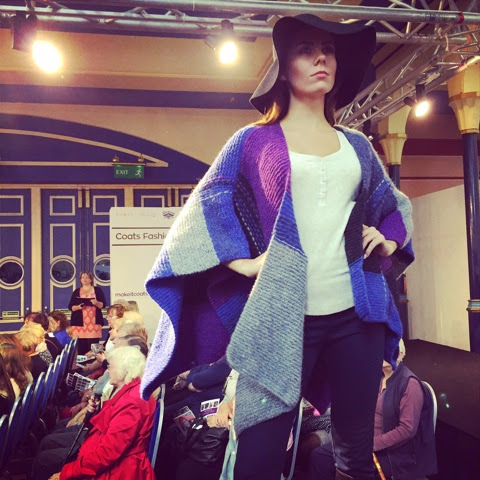 The show was gigantic, with lots of shopping opportunities, as well as lots of craft workshops and lectures. 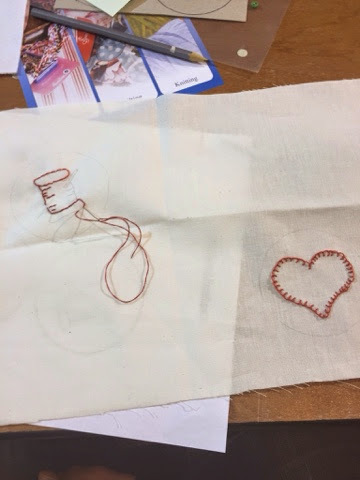 I went along to a red work class to make a needle keeper. I then hit the shopping opportunities big time. 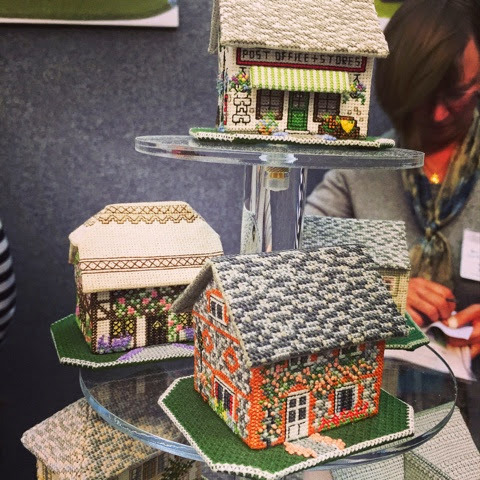 There was a real mix of stalls, quite a lot was for crafters perhaps a little more traditional than I am (but even then I found their stuff lovely, like these 3D needlework cottages from The Nutmeg Company, don't you just love the little post office?). But there was also plenty of more modern stuff and it was great to see stuff actually made up from popular craft books and companies, such as from Louise Walker's Faux Taxidermy Knits (the two animal heads), Merchant and Mills (the dresses) and Sew Over It (not pictured but they do have a new London shop opening soon!). There was also lots of fantastic suppliers, it was great to see companies I'd previously only known from the web in the flesh, such as The Eternal Maker (some great fat quarters) or to find companies that I hadn't heard of before but totally won me over with their products and their enthusiasm, such as Ernest Wright and Son, who make the most beautiful scissors that feel like you're cutting through butter (check out this short film about how they make their scissors). There were also lots of gold work and bead work suppliers to, selling stuff that isn't always easy to find even with the aid of a Google search. 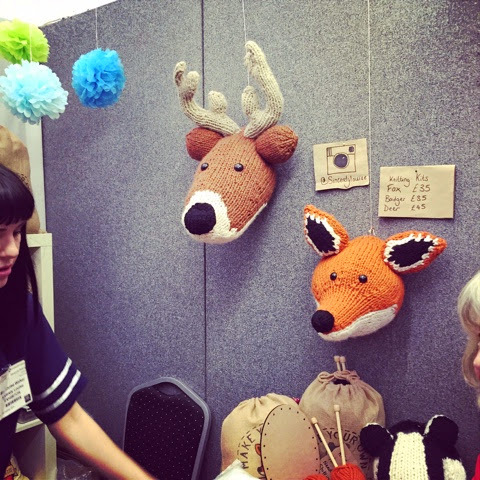 This makes The Knitting and Stitching Show a great place to find new craft supplies long term, as most of the suppliers also have websites, so even if you go along to the show feeling a bit broke, you can easily come away with a long list of companies you can try in the future. 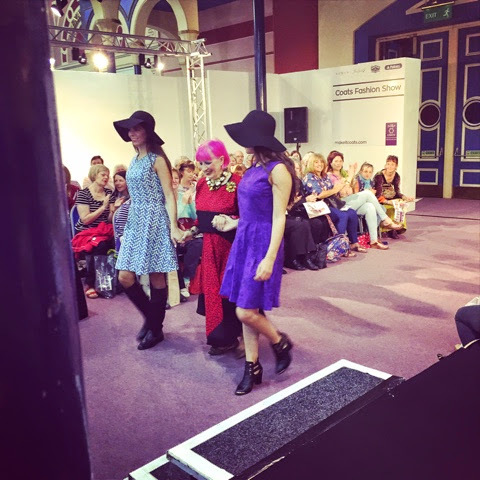 There were also lots of displays of work, from a fashion show from Coats, featuring among others knitwear from Rowan and fabrics designed by Zandra Rhodes for Freespirit. As well as art work from individual artists, my favourite was work by Renate Keeping. So, I had a fantastic day, time flew by, before I knew it I'd been there all morning and a good chunk of the afternoon. I will definitely be back next year. 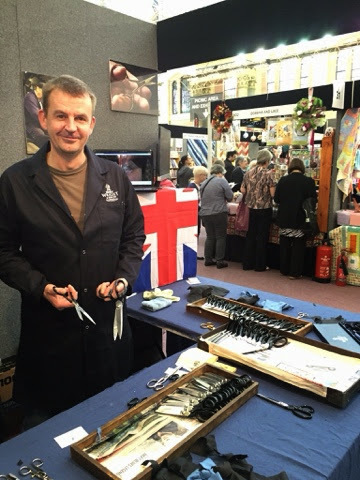 But it's not too late to go this year, as it's still on tomorrow (12th October) between 10am and 5pm. Thanks to all who entered our giveaway - our random winner is Kendra! These are very attractive and I would love to work with them. I especially like the blue shades as I am working on a blue wool project. It would be fun to add these wools. 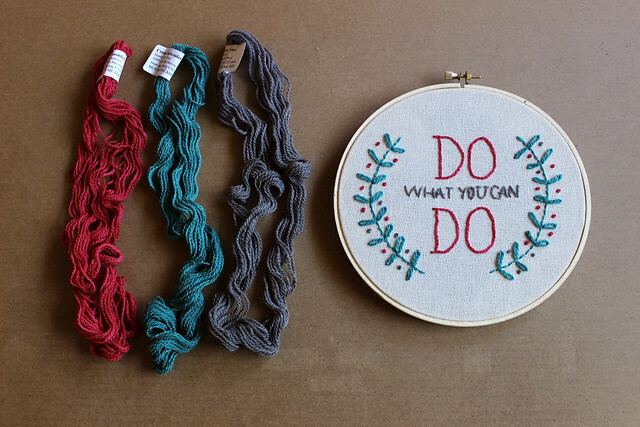 Hope you enjoy your threads, Kendra, and thanks, Mountain Meadow Wool! Which is Whiplashed, who would like to make a lion! Well done Whiplashed, we'll be in touch to get your details to send to the publishers for your prize. 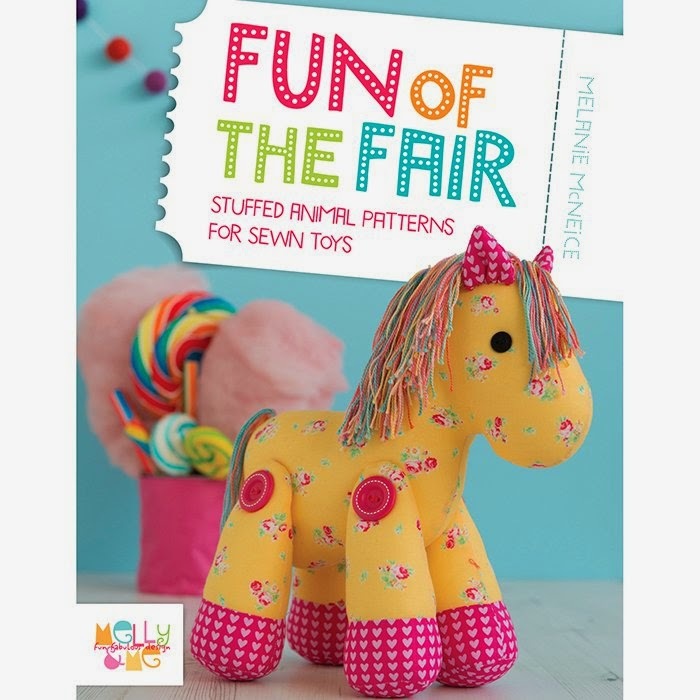 Thank you again to Stitch, Craft, Create for letting us review the book and thank you to everyone for your entries, I enjoyed reading what you would make. 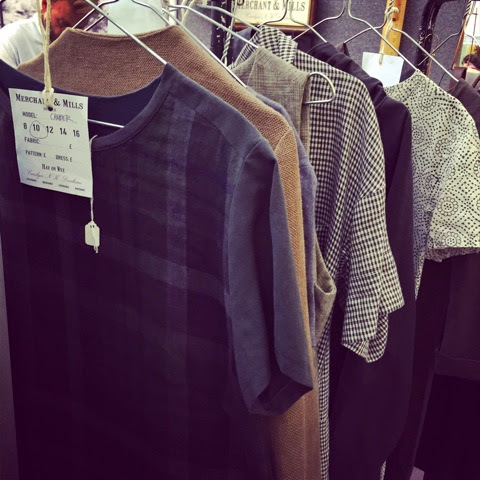 Mountain Merino Wool Review and Giveaway! Hello all! 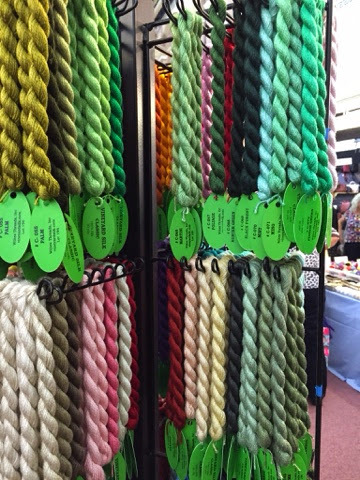 Recently the nice peeps at Mountain Meadow Wool sent me 4 shades of their beautiful Mountain Merino wool, in a new weight made especially for crewel embroidery. And not only did they send me the wool for review, they are also doing a giveaway on Feeling Stitchy - stay tuned for the details later on in this post! But first off, let's have a look at that lovely wool! I was afraid it would be super-chunky to stitch with - not so! It fits easily through the eye of the crewel needle I embroider with, and the lines were a bit chunky, but not as thick as I'd assumed. I'd say it's equivalent to stitching with 6 strands of cotton embroidery floss. 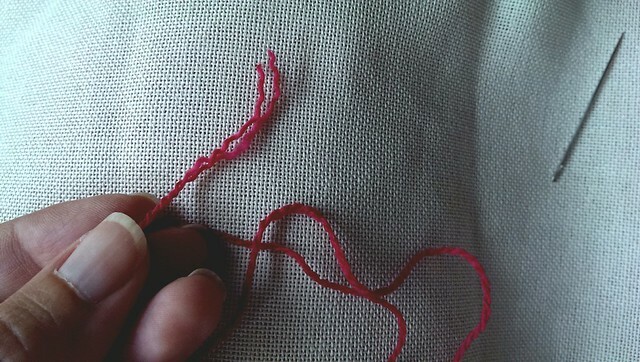 If you need really fine detail, you could divide the strand into 2 as necessary. Like other crewel wool, it has a nice, springy texture, and since it is hand-dyed there's a natural color variation - almost a heather texture to all the shades. I did notice it knots up a fair bit when pulling through the fabric - so my suggestion is to work with short lengths of thread. The 2 ply thread makes it stronger than 1 strand of crewel wool, so it won't break when you pull it tightly. Since it's merino wool, it feels softer and less scratchy than regular wool under your fingertips - it's very nice to work with. I used a back stitch and lazy daisy stitch on the leaves - You can really see the nice pearl texture. 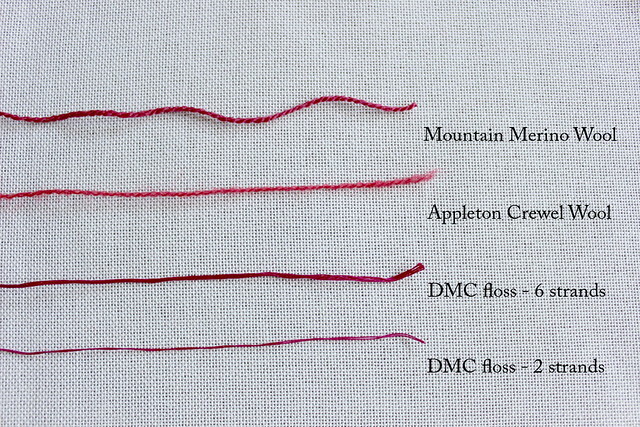 Knots were made by wrapping the needle once with the wool. The large letters were stitched with a split stitch. So, to sum up my review - this is a very nice quality wool, with a wonderful hand-dyed texture that looks beautiful when stitched. 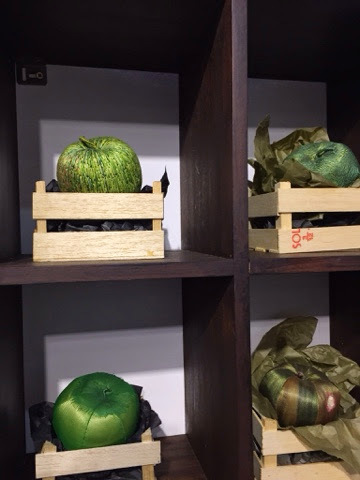 Now for the exciting part - a giveaway! At last glance, the merino wools have not yet been added to the Mountain Meadow Wool site, so 1 lucky reader will be receiving a sneak preview of their Mountain Merino wools for embroidery! 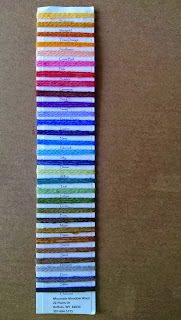 This color card shows the full range of colors - please forgive the lighting in this pic and be aware that the colors may not be an exact match, but this is close! by Sunday, 9 PM CSTwe've gotten such a nice response on this post that I'm extending the deadline through tomorrow, Monday 12 PM CST! 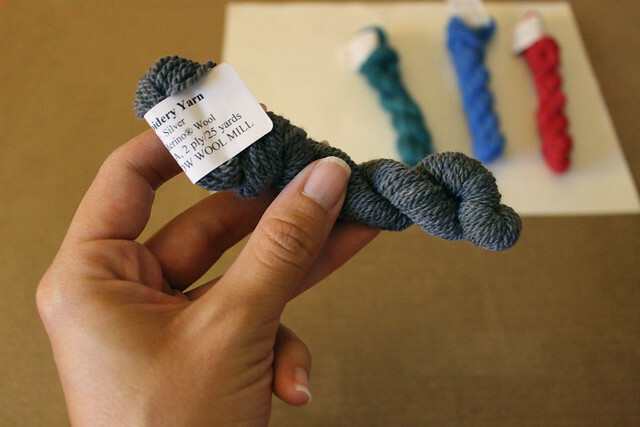 Thanks again to Mountain Meadow Wool for making this review and giveaway possible! You have until October 31, 2014 to be eligible for random drawing.